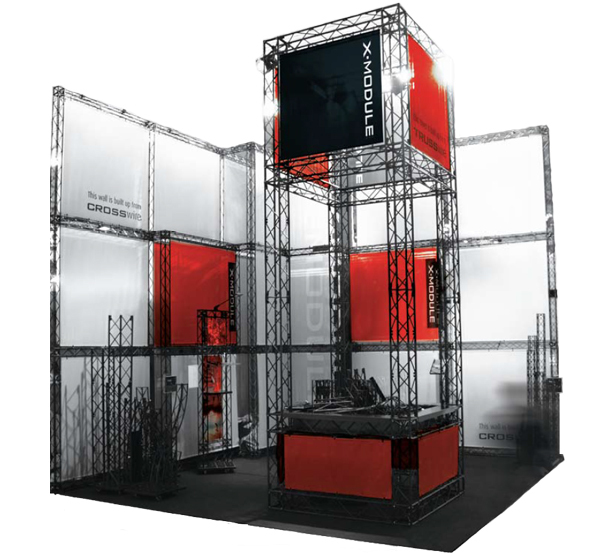 X-20 TRUSSwire was designed for medium sized exhibition stands and trade shows. With a 20cm x 20cm profile when extended, TRUSSwire folds away to be almost completely flat after use. Because TRUSSwire is a foldable truss system, it is very easy to transport and store. Suitable for both indoor and outdoor use, TRUSSwire supports a unique system for displaying exhibition graphics. Artwork simply clips into place between the framework, creating an extremely professional semi-permanent structure. TRUSSwire can be adapted to suit virtually any floor space or height. Most trussing or gantry systems are made from steel or large bore aluminium tubing. They are very heavy and difficult to set-up / dismantle. Traditional trussing systems do not fully integrate with signage, electronic displays or lighting concepts. TRUSSwire is totally different. Manufactured from a composite outer with an aluminium core, TRUSSwire is exceptionally strong yet lightweight. With impressive span/weight capabilities, TRUSSwire can be used to create large format display walls and towers with ease! TRUSSwire can be folded for easy assembly, transportation and storage. Made from composite with an aluminium core, TRUSSwire is extremely strong yet very light. With a range of innovative connectors, TRUSSwire is easy and fast to build without the need for tools. Thanks to a composite outer, TRUSSwire is impervious to scratching and stays looking fresh for years. Fully weatherproof, TRUSSwire can be used outdoors without degradation. Add back-lighting, plasma TV screens, literature holders or counter tops as required. Lease modules as required to supplement your other stand infrastructure. Bring your X-20 stand to life and create eye-catching, dynamic visuals with the X-PO Light backlit display!